Small-scale fisheries could pose a more serious threat to marine life than previously thought. Research led by the University of Exeter, published today (19 July) in the British Ecological Society's Journal of Applied Ecology, shows that tens of thousands of turtles from across the Pacific are being captured through the activities of small-scale fisheries. Focusing on fisheries in Peru, the study suggests that thousands of sea turtles originating from nesting beaches as far away as Australia, Costa Rica, Mexico and the Galapagos, are likely to be captured each year as bycatch while they forage in Peru's waters. 'Bycatch' is the term used to describe fish or other sea animals being caught unintentionally by fisheries and is usually associated with large-scale industrial fishing, such as trawling and longlining. This study shows the effect of small-scale nets and longlines on marine turtle bycatch. Some are kept for consumption and while the majority are released alive, they are often injured as a result of becoming tangled in fishing gear. Senior author Dr Brendan Godley of the University of Exeter said: "We have known for a long time that, along with sharks, marine mammals and seabirds, marine turtles often become bycatch as a result large-scale fishing. It is only recently that we have begun to realise that small-scale fisheries may also have a significant impact on marine life. However, we were very surprised when our study revealed just how large an impact small-scale fisheries have on sea turtles." The Pacific waters around Peru serve as important foraging areas for five species of marine turtle, including loggerhead, green, leatherback, olive ridley and hawksbill turtles. 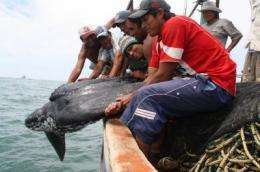 As part of a broad international collaboration to evaluate fisheries impacts, the researchers monitored four key Peruvian fisheries to observe fishing techniques and record the number of turtles caught. The team believes these data are vital for developing effective conservation strategies to reverse the declines of populations of marine turtles and other vulnerable species. Fishing is a growing industry in Peru and the country is now home to more than 100 ports, nearly 10,000 fishing vessels and 37,000 people working in fisheries. The industry provides an increasingly important role as an employer in Peru. The research team suggests that changes to fishing practices, such as introducing circle hooks and dehookers to line fishing and using net illumination, could help reduce sea turtle bycatch. 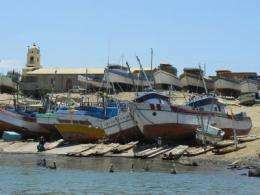 University of Exeter Darwin Scholar and lead author Joanna Alfaro said: "Coastal communities in developing countries, such as those I work with in Peru, rely heavily on fishing for their food and livelihoods. In fact, these fisheries are among Peru's main employers. Therefore it is important to find solutions that can ensure the continuation of Peru's fisheries. IMARPE, a Peruvian government research body, will help implement these solutions in Peru's small-scale fisheries. We have already started working with local people in Peru to try and tackle to the problem of turtle bycatch." "The findings of this study tells us that acting locally to reduce bycatch in small-scale artisanal fisheries will be essential to succeeding globally in the international effort to prevent further declines in marine biodiversity" said Dr Peter Dutton, a leading sea turtle scientist with the US National Marine Fisheries Service who, along with co-author Dr Jeffrey Seminoff, is working together with Peruvian and other international partners to implement recovery plans for endangered sea turtles in the Pacific.